With the UK’s Joint Terrorism Analysis Centre (JTAC) raising the UK threat level to ‘critical,” almost 1,000 British Army soldiers from the Paratroop regiment and Irish Armed Guards will be deployed on the streets of London to reassure the public and support police officers in the wake of a terrorist attack on a concert venue in Manchester. 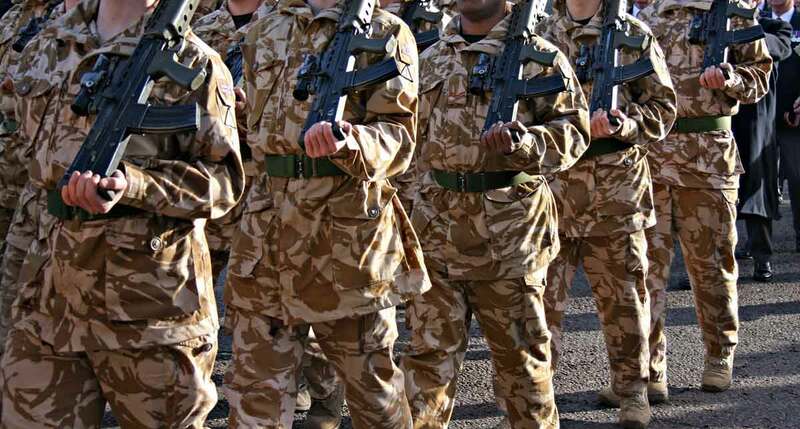 The Metropolitan Police asked the Secretary of State for Defence for authorisation to deploy armed military personnel in support of their armed officers. The Prime Minister Theresa May said the request was part of a well-established plan, known as Operation Temperer. Operation Temperer was orchestrated under the previous Prime Minister, David Cameron’s government in the wake of the French terror attacks in 2015 in the Île-de-France region, where 17 people were killed in four shooting attacks and 22 other people were wounded. Under Operation Temperer, armed police officers responsible for duties such as static armed guarding at key locations including Buckingham Palace, Downing Street, embassies and the Palace of Westminster, will be replaced by armed military personnel, which will allow the police to significantly increase the number of armed officers on patrol in key locations. Prime Minister May says military personnel will also be deployed at certain events, such as concerts and sports matches, helping the police to keep the public safe. Yet, when details of Operation Temperer were first leaked back in 2015, some politicians expressed concern that large numbers of armed military personnel on the UK's streets could endanger members of the public. The plans are also believed to have caused concerns amongst senior Army decision-makers in terms of the length of any such deployment and how it may detract from usual Army deployments, training and duties. Operation Temperer could put a strain on an already depleted British Army, which has had to cut some 20,000 posts due to budgetary constraints. As part of the British Army's Army 2020 re-organisation, more emphasis is being placed on the formation of specialist higher-readiness Reaction Forces and Strike Brigades for short-notice contingencies of a military nature, and an Adaptable Force made up of regular Army personnel and reserves. Questions will remain however as to whether Operation Temperer is the best use of those depleted Army resources, and how long the Armed forces are likely to be required to perform such a role? The Army will be reluctant to commit large numbers of forces for an uncertain period of time, when they are only performing at best, ‘guard duty’. It is also unclear how an increased military presence could prevent further terrorist attacks, given that most terrorists are usually intent on killing themselves, alongside others. The British Army's Parachute regiment is an important cornerstone of the Army's rapid intervention capability and typically support UK Special Forces, but they are trained for higher-level specialist tasks than guarding Buckingham Palace. Aside from the current operations, the Army and the police have worked closely together before during The Troubles in Northern Ireland, when tens of thousands of British troops were deployed to support the Royal Ulster Constabulary. But that was at a time when the only known terrorist threat to the UK was the IRA. Now the UK faces a range of terrorist threats from individuals and terrorist networks like Daesh and Al-Qaeda. The British Army was also deployed to help with security arrangements during the 2012 London Olympics, but again that was only for a short and well-defined period of time. Following the 2005 terrorist attacks on the London underground, armoured vehicles and military personnel were deployed, namely to London Heathrow to protect the airport against a perceived threat of attack from terrorists using shoulder-launched rockets. With the UK threat level being reduced back to 'severe,' one level below critical, the UK Ministry of Defence announced that the 1,000 military personnel made available to assist the police would be stood down from midnight on Monday the 29 May. "This will see a gradual reduction of military support to regional police forces over a three-day period," the MoD stated. Service personnel wlll remain at readiness to deploy in support of the police should future security situations require.